∧ 그로 : 나폴레옹 I 세가 전염병에 걸린 환자 들을 방문. 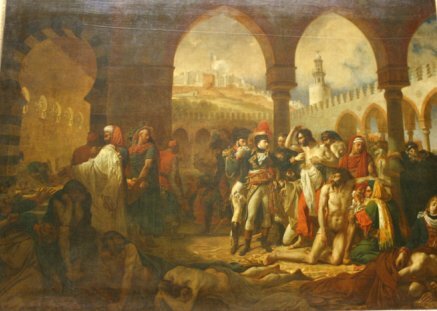 Antoine-Jean Gros(1771-1835), Napoleon Visiting the Plague-stricken at Jaffa, 1804, The Louvre Museum. * 나폴레옹 I 세가 자신의 '선전용'으로 그리게 했다. * 그로, Baron Antoine-Jean Gros : 프랑스의 화가; 나폴레옹 I 세의 종군화가였다. French painter. ∧ 데이비드, 자크-루이: 나폴레옹의 대관식(일부), Jacques-Louis David (1748-1825), Coronation of Napoleon (only part), 1805-07, The Louvre Museum. * 1804년 12월 2일, 나폴레옹 보나파르트의 황제로의 즉위식은 노트르담 성당에서 열린다. 센터스테이지에 있는 나폴레옹은 교황 비오 7세 에게서 왕관을 갖고 와서 자기머리에 자신이 올리고, 그리고 그의 황후, 조세핀의 머리위에 그 자신이 관을 씌운다. 교황 비오 7세는 이 대관식에 마지못해 참석하였다. 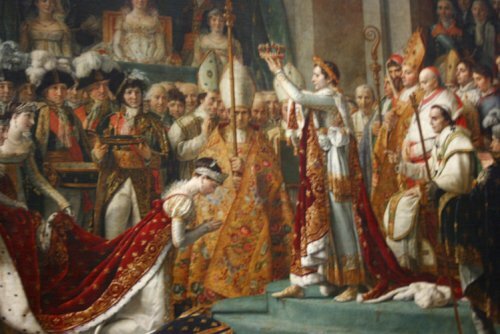 On December 2, 1804, the coronation of Napoleon Bonaparte as emperor of the French took place at Notre-Dame Cathedral in Paris. Napoleon, at center stage, was anointed, took the imperial crown away from Pope Pius VII, and crowned himself and then his empress. * 데이비드, Jacques-Louis David : 프랑스의 화가. 나폴레옹 I 세의 궁정화가였다. French painter and leading figure in the neoclassical movement. David welcomed the French Revolution in 1789 and painted pictures including The Oath of the Horatii, etc. 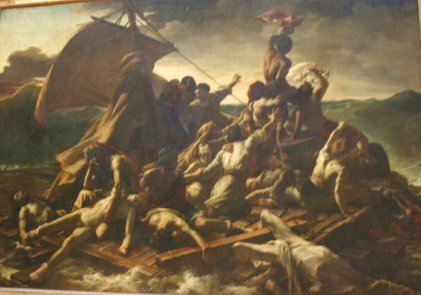 ∧ 테오도르 제리코: 메두즈호의 뗏목, Theodore Gericeau (1791-1824), The Raft of the "Meduse", 1819, The Louvre Museum. * 1816년에 프랑스의 프리케이트 함 메두사호가 이민을 옮기는 도중에 선장의 무경험으로 좌초했다. 장교들과 고위인사들은 구명보트를 타고 구조 되었다. 나머지 150명 승객들은 뗏목을 급조, 광대한 바다를 13일간 표류하다가 15명이 생존하였다. 이에 생존자의 증언을 듣고 그린 그림으로, 살기 위해 생존자들이 저질렀던 살인, 비열한 행위 등 인간적 죄악을 시각화한 혁명적인 작품이라고 할 수 있다. In 1816 the frigate La Meduse ran aground off Cape Blanco. The officers and dignitaries aboard the ship took to the lifeboats, while a raft was constructed to hold the crew and other passengers. The raft held almost a 150 people who were then abandoned to their fate. After drifting at sea for 13 days, only 15 of them were left alive when they were rescued by the navy vessel Argus. The raft, laden with bodies, some of them lifeless, rides the waves of a dark and stormy sea. He conveys in masterly fashion the feelings of fear, madness and foreboding that appear on the faces of the survivors. ∧ 제리코: "미친 여자" 또는 '질투'에만 집착하는 정신병자. Theodore Gericault (1791-1824), The Monomaniac of Envy, c.1819-22, Museum of Fine Arts, Lyon, France. * 제리코: 프랑스의 화가. Gericault, T: French painter. ∧ 외젠느 들라크루아: '민중을 이끄는 자유의 여신'. 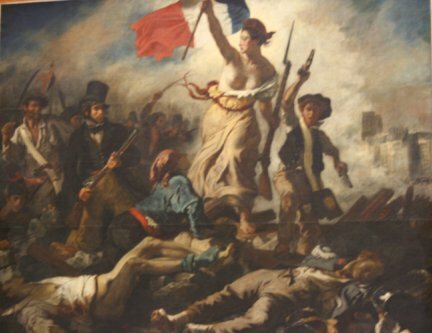 Eugene Delacroix (1798-1863), Liberty Leading the People, 1830, The Louvre Museum. * 1830년 7월 28일에 복고왕정에 반대하여 일어선 시민들이 3일간의 시가전 끝에 부르봉 왕가를 넘어뜨리고 루이 필립을 국왕으로 맞은 7월 혁명("July Revolution")을 형상화한 것이다. 군중의 선두에 나서 깃발을 들고 있는, 그리고 서슴없이 앞가슴을 내보이는 여인은 건강미와 관능미를 보인다. 자유의 여신 곁에 높은 모자를 쓰고 두 손으로 총을 쥔 청년이 보이는데 화가인 들라크루아 자신의 초상이라는 것이다. 자유를 승취하는 서민의 용감한 모습이 시체가 쌓여있는 위를 전진해 가는 자유를 위해 항쟁하는 영웅시민의 행동을 본다. In 1830 the Bourbons, back on the throne of France after the Congress of Vienna, were swept away by a popular insurrection that lasted just 3 days, and which has gone down in history as the "July Revolution." Delacroix took part in the uprising, and is shown here on the left of the composition, advancing with determination, a top hat on his head and a rifle in his arms. In keeping with the patriotic idealism of the work, Delacroix painted the picture predominantly in the colors of the flag of the French republic, red, white and blue. 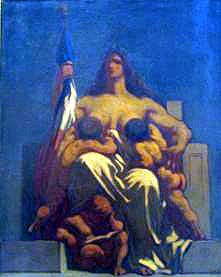 The figure of Liberty is shown as "a strong woman with firm breasts, a husky voice, solid hips." * 들라크루아, Delacroix: 프랑스 낭만주의의 대표적 화가. 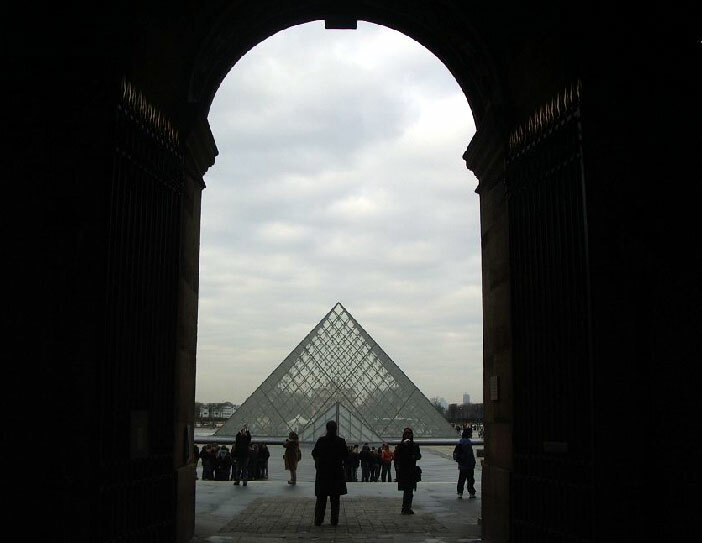 French painter and leading figure in the romantic movement in art. ∧ 아리 셰페르: 단테와 버질 앞에 나타난 파올로와 프란체스카의 혼백. 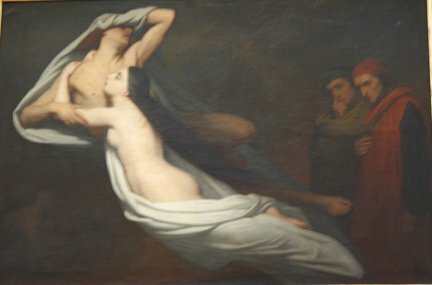 Ary Scheffer (1795-1858), The Ghosts of Paolo and Francesca Appear to Dante and Virgil, 1855, Louvre, Paris. * 형수(프란체스카)와 시동생(파올로) 사이인 두 사람은 서로 사랑하게 된다. 간음한 죄로 비참하게 살해되어 지옥을 떠도는 망령이 됐다. 이 그림은 지옥을 찾은 시인 단테와 버질 앞에 나타난 두 사람의 모습을 그린 것이다. * Ary Scheffer: Dutch-born French painter. He achieved great popularity with sentimental scenes from literature and history. He painted the portrait of Charles Dickens 1856. ∧ 장 오귀스트 도미니크 앵그르: 마드모아젤 리비에르. 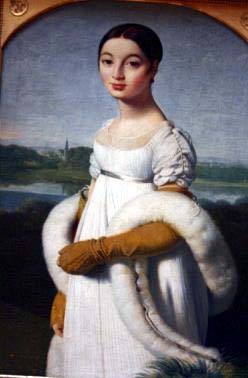 Jean-Auguste Ingres (1780-1867), Portrait of Mademoiselle Riviere, 1806, Louvre, Paris. * 장 오귀스트 도미니크 앵그르 : 19세기 프랑스의 고전파 화가이다. 들라크루아가 이끄는 신흥낭만주의 운동에 대항하는 고전파의 중심적 존재가 되었다. 초상화·, 역사화, 특히 그리스조각을 연상케 하는 우아한 나체화에서 묘기를 발휘했다. 프란체스카와 파올로 두 연인의 이야기는 13세기 말 실제로 일어났던 사건을 배경으로 한다. 말라테스타 가문과 다 폴렌타 가문은 상권에 대한 이득을 취하기 위해 정략결혼을 계획했다. 다 폴렌타 가문에는 상속 여 프란체스카가 있었고, 말라테스타 가문에는 두 형제가 있었다. 동생인 파올로는 젊고 잘생겼지만, 형인 조반니는 용감하였지만 절름발이였다. 그러나 프란체스카는 상속자인 형 조반니와 결혼을 해야 했다. 고심하던 말라테스타 가문의 사람들은 미남 동생 파올로에게 청혼하도록 한다. 프란체스카는 아무 의심 없이 파올로를 따라가 행복한 결혼식을 올리고 첫날밤을 보내게 된다. 그런데 새벽에 잠을 깬 프란체스카는 그와 같이 밤을 보낸 사람은 파올로가 아닌 불구자 조반니였다는 것을 발견한다. 형 조반니는 성을 비우는 날이 많아졌다. 프란체스카와 파올로는 연애소설을 같이 읽던 중 주인공들의 키스장면에서 애써 억눌린 감정이 폭발해 불륜을 저질르게 된다. 프란체스카가 파올로와 한창 사랑을 나누고 있는 순간에 조반니가 칼을 들고 두 사람을 덮친다. 비련의 남녀, 형수와 시동생 사이인 두 사람은 간음한 죄로 비참하게 살해되어 지옥을 떠도는 망령이 됐다. 이 그림은 지옥을 찾은 시인 단테와 버질 앞에 나타난 두 사람의 모습을 그린 것이다. Francesca da Rimini(1255-1285) was the daughter of Guido da Polenta, lord of Ravenna. She was a historical contemporary of Dante Alighieri, who portrayed her as a character in the Divine Comedy. Guido I da Polenta had been at war with the Malatesta family. When a peace was negotiated, Guido wanted to solidify it by marrying his daughter Francesca to the Malatestan heir, Giovanni Malatesta, son of Malatesta da Verucchio, lord of Rimini. Giovanni was brave but lame and deformed. Guido knew Francesca would refuse Giovanni, so the wedding was performed by proxy through Giovanni's handsome brother, Paolo. Francesca fell in love with Paolo and was unaware of the deception until the morning after the wedding day. Francesca and Paolo were seduced by reading the story of Lancelot and Guinevere, and became lovers. Subsequently they were surprised and murdered by Giovanni. Ref: 1) Wikipedia와 다른 인터넷. 2) 단테(Dante, 1265-1321)저, 이영숙 역: 神曲, 1983. 4. 앵그르, Ingres/프라디에, Pradier/들라크루아, Delacroix. 2008/05/03 오 전 12:17 | 프랑스 박물관. ∧ 장 오귀스트 앵그르: 오달리스크. Jean-Auguste Ingres (1780-1867), 1814, La Grande Odalisque, The Louvre Museum, Paris. * 오달리스크(Odalisque)는 회교국에서 볼 수 있는 '여자노예, 또는 소실'을 뜻한다. 이 그림은 규격이 맞지 않는다. 얼굴은 작고, 왼 팔은 바른 팔보다 짧고, 골반이 길다. 이것이 회교국의 군주들에게 세속적인 만족을 줄 수 있고, 더 관능적으로 보이게도 한다. 이 그림은 소위 "동양신비주의 또는 취미(Orientalism)"를 나타내고 후에 프랑스에서 대단한 인기를 올린다. He portrays a concubine in languid pose as seen from behind with distorted proportions. The elongations have been deliberate distortions. 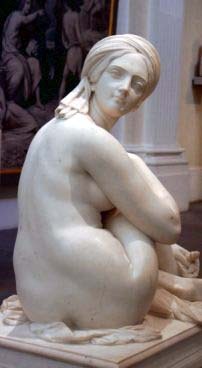 The left arm of the odalisque is shorter than the right. The figure was longer by five instead of two or three vertebrae and that the excess affected the lengths of the pelvis and lower back instead of merely the lumbar region. Given how the duty of concubines were merely to satisfy the carnal pleasures of the sultan, this elongation of her pelvic area may have been a symbolic distortion by Ingres. He anticipated the genre of "Orientalism," which was to prove extremely popular in French art. ∧ 프라디에: : 오달리스크, James Pradier, Odalisque, 1841, Museum of Fine Arts, Lyon, France. ∧ 장 오귀스트 앵그르: 목욕하는 여자. Jean-Auguste Ingres (1780-1867), The Bather, The Louvre Museum, Paris. ∧ 외젠느 들라크루아: 알제리의 여인들. Eugene Delacroix (1798-1863), Women of Algiers in Their Apartment, 1834, The Louvre Museum, Paris. * 후궁으로 있는 하렘의 여자들은 침묵을 지키고 있다. 단지 흰 블라우스를 입고 있는 여자가 아편을 피우고 있다. 단조로운 생활 속에 외부와 격리되어 있는 이 여인들은 별 관심사도 없이 단조로운 생활을 영위한다. 반면에 호화롭게 장식되어있는 카펫에 앉아있고, 그리고 값비싼 목걸이를 걸고 있다. In the silence of the harem no one　speaks and only the beautiful woman in the white blouse parts her lips to exhale the smoke of the hookah; the gazes are distant and indifferent and reflect the resignation of these women, segregated in a world of monotonous idleness in which the only bright touches of life are provided by the fabrics embroidered with gold, the colored rugs and the precious necklaces. 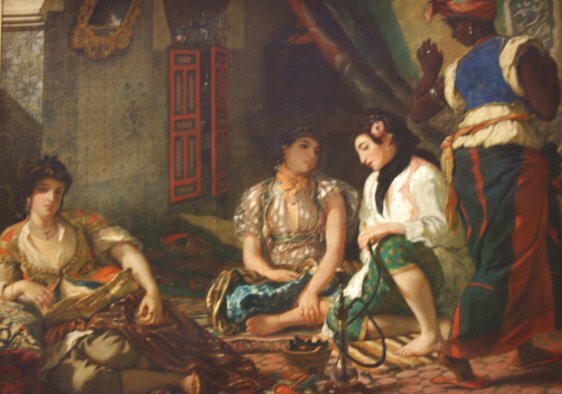 The painting is notable for its sexual connotations; it depicts Algerian concubines of a harem. It also depicts opium, which often accompanied paintings of prostitutes. 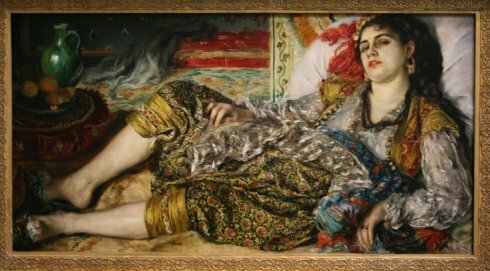 In the 19th century, the painting was known for its sexual content and its orientalism. ∧ 장 오귀스트 앵그르: 터키 목욕탕. Jean-Auguste Ingres (1780-1867): The Turkish Bath, 1863, The Louvre Museum, Paris. * 가운데 앉아 있는 '서양인'인 금발의 여자가 경험한 것을 기초로 그린 그림이다. 노예가 그들의 머리를 가다듬는 동안 터키 여인들은 음료수를 맛이고 있다. 장-프랑스와 밀레, Jean Francois Millet (1814-75): 프랑스의 화가로 농부들의 삶을 주로 그리었다. French painter whose pictures concentrated on themes of peasant life. ∧ 장-프랑스와 밀레, 만종(晩鍾). Jean-Francois Millet(1814-75), The Angelus, 1857, The Orsay, Paris. (Copied from Internet). 저녁노을이 지는 들녘에서 한 가난한 농부 부부가 고개를 숙인 채 기도를 하고 있는 그림으로 보인다. 캐다가 만 감자가 바닥에 흩어져 있고 멀리 보이는 교회당이 정지된 아름다움의 극치를 보여준다. 그렇지만 이 그림에는 슬픈 이야기가 숨어있다. 젊은 농부 부부가 바구니를 밭 밑에 놓고 기도하고 있는데 사람들은 그 바구니가 감자 씨와 밭일도구를 담은 바구니로 알고 있다. 그런데 사실은 그 바구니에는 씨감자가 들어있던게 아니라 그들의 사랑하는 아기의 시체가 들어있었다. 그 시대 배고픔을 참고 씨감자를 심으며 겨울을 지내면서 봄이 오기를 기다리고 있었다. 하지만 그들의 아기는 배고픔을 참지 못해 죽은 것이다. 죽은 아기를 위해 마지막으로 부부가 기도하는 모습을 그린 그림이 '만종'이다. 왜 그림 속의 아기가 사라졌을까? 이 그림을 보게 된 밀레의 친구가 큰 충격과 우려를 보이며 아기를 넣지 말자고 부탁을 했다. 그래서 밀레는 고심 끝에 아기 대신 감자를 넣어 그려 출품했다. 그 이후 이 사실이 알려지지 않은 채 그저 농촌의 평화로움을 담고 있는 그림으로 유명해졌다. 미술관이 자외선 투사작업을 통해 그 감자자루가 초벌그림에서는 실제로 어린아이의 관이었음을 입증한 것이다. (인터넷에서 베낌). 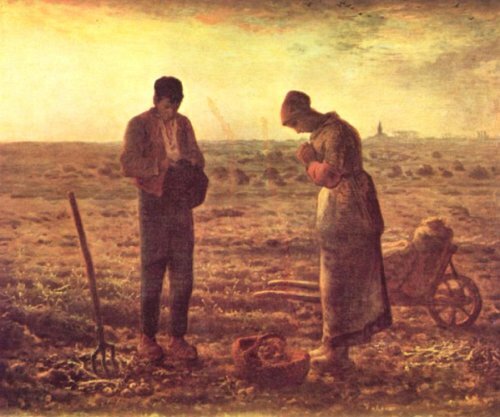 Commissioned by a wealthy American, Thomas G. Appleton, and completed during the summer of 1857, Millet added a steeple and changed the initial title of the work, Prayer for the Potato Crop to The Angelus when the purchaser failed to take possession in 1859. This famous painting depicts a young man and a young woman, both farmers, standing in a field and reciting the Angelus, a prayer which commemorates the annunciation made to Mary by the angel Gabriel.. He holds his cap reverently as he stands with head bowed. She in a white cap and long blue apron over her dress clasps her hands as a prayerful look sets her face. They pause in prayer near the end of the work day. At the woman's feet is a basket of potatoes, and at her far side rests a wheelbarrow full of empty sacks. The viewer can almost hear the bells ringing from the spire of the church in the distant right of the painting. (copied from Internet). 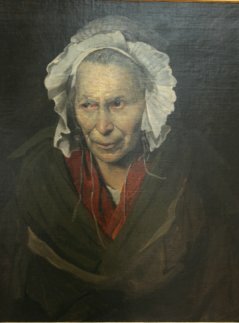 오노레 도미에, Honore Daumier (1808-79) :프랑스의 화가, 석판화가, 조각가; 사회, 정치를 풍자한 석판 만화에 걸출. French caricaturist and painter whose satirical lithographs in La Caricature and Le Charivari exposed the foibles of contemporary French government and society. ∧ 도미에: 공화국. Honore Daumier, The Republic, The Orsay, Paris.